Fun Party Kissing info about the game-Games2Rule. 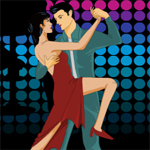 A cute young couple dancing together on a party and where in the mood for kiss. Make the couple to kiss passionately without getting caught by othe couples as otherwise you will lose a life. Just make them kiss watchfully to fill the kissing loader within specified time duration in each level.